The corner is much stronger with the first-line hane at . Can white do anything? Because of , the solution for Shape 33 stops working. 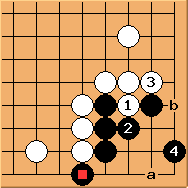 If white continues to play 'a', black is able to use 'oshi-tsubushi' to kill white. If occupies this key point first, is a good move. To continue from the previous diagram, the only thing white can do is to make / exchange. Please confirm the corner is a seki. 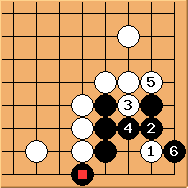 Diagram 34.5: Can white form a ko? 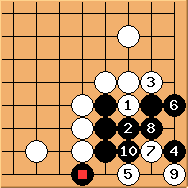 Since white cannot kill the corner, an outcome of ko would be the next best. 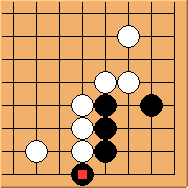 White hopes black to play 'a' so that Diagram 33.3 applies; or if black playes 'b', white can choose one of the ko options in Shape 7. However, black has better defence. is a famous tesuji! 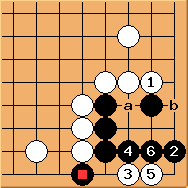 If , black occupies the second 1-2 point and there is just enough room to make two eyes. If occupies another 1-2 point, is good, recovering Diagram 34.2. If , is good. Black makes the first eye in the corner, leaving miai point 'a' and 'b' for the second eye. If , is the correct move, ensuring to recover Diagram 34.2 again. 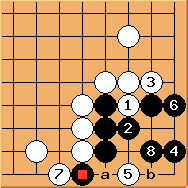 If white makes / exchange first before blocking at , is still the tesuji, leaving 'a' and 'b' miai points to live. To reply , is still the best move. White has a number of options. Clear 'a' and 'b' are miai points. To reply , is calm, still leaving 'a' and 'b' as miai. Finally, results in a double-ko. In most cases, black would be unconditionally alive. 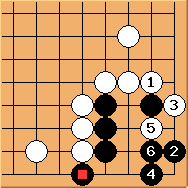 To summarise: with the first-line hane, black corner is very safe. 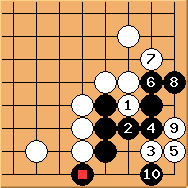 The best white can get is seki in Diagram 34.3 and 34.4. 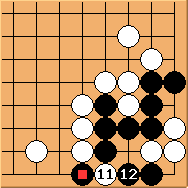 Black needs to know the 1-2 point tesuji. 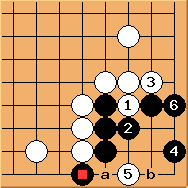 In very rare cases, white may consider Diagram 34.13 (see how a double-ko may be exploited in this pro game ).